Experience both the historic and modern sides of fabulous Dubai during this 4.5-hour private sightseeing trip covering some of the city’s top sights. Step back in time on a visit to the Dubai Museum, located within the 18th-century Al Fahidi Fort. 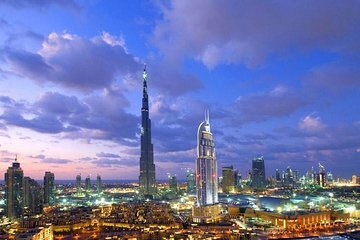 Then check out Dubai’s building boom as you visit the Burj Al Arab (the world’s only seven-star hotel), the Mall of Emirates, and the towering Burj Khalifa, the world’s tallest building. You’ll also have time to see Jumeirah Mosque, Palm Island and Atlantis Hotel. Your trip also covers round-trip transport from your hotel. Private transport means a flexible itinerary, fewer crowds, and longer stop times. Pas professionnel du tout. Aucune information et le programme annoncé n'est pas respecté. Non, non et non!!! Vorab, wir sind normal wenig kritisch aber diese Rundfahrt ist ihr Geld absolut nicht wert. Abholung klappte mit einigen Umständen aber nicht der Rede wert. Der Guide sprach ein sehr schlecht verständliches Englisch, wenn er denn sprach. Es gab so gut wie keine Informationen über die einzelnen Sehenswürdigkeiten. Das Fort Al Fahidi würde gar nicht angefahren. Einmal kurz am Goldsouk von Deira vorbei ohne Stop geschweige denn Infos. An der Jumeirah Moschee sind wir nur durchgefahren, dafür an einer anderen Moschee kurz angehalten um dann einen Artshop geführt zu werden, wo etwas gekauft werden sollte. Dann kaum Angaben zum Burj Arab oder zu the Palm. Das gleiche gilt für die Weiterfahrt an Burj Kalifa und den Financial District, an der Dubai Mall wurde kurz umgedreht. Insgesamt eine sehr schlechte, langweilige Tour, die nicht einmal die angebotenen Leistungen einhält. Advertised as private tour but it is actually a group, the guide is quite boring. I don't actually understand most of what he is saying. But the views the amazing. Very poor. Didn't even see the Palm Island, Dubai Museum and only drove past the Mall of Emirates at a very fast speed. We were unable to walk see the Mosque well as we were instructed to stay on the other side of the road. We only saw Burj Khalifa because it was so big and visible everywhere we went. Did not even go 1km near it. Our driver/guide could barely speak English so we had to keep questions and conversation to a minimum. The Jumeirah Mosque is unimpressive, go to Abu Dhabi if you want to see a mosque worth visiting. Dubai Museum was a waste of time as well for a city that really has no history. You'd be better off exploring the city by Metro as the traffic can be ridiculous. our driver was half an hour early for us and also in the other side - that has hounded us something. Actually, this tour was more of a taxi what has brought us 4 people to the individual locations. Along the way there was little information and we were sold everywhere and collected again after a certain time. In the mosque, we spent more than an hour. The lecture was interresting but I had hoped to see more of the rooms. The was a good tour seeing everything that listed in the itinerary. It was a group tour and not a private tour as advertised. The tour was a good overview of the city of Dubai.